Carey Estes Kefauver, 1903–1963. Congressman and United States Senator from Tennessee. Political content Typed Letter Signed, Estes, with autograph postscript. One page, 8" x 10½", November 14, 1955, on stationery of the United States Senate, Washington, D.C. 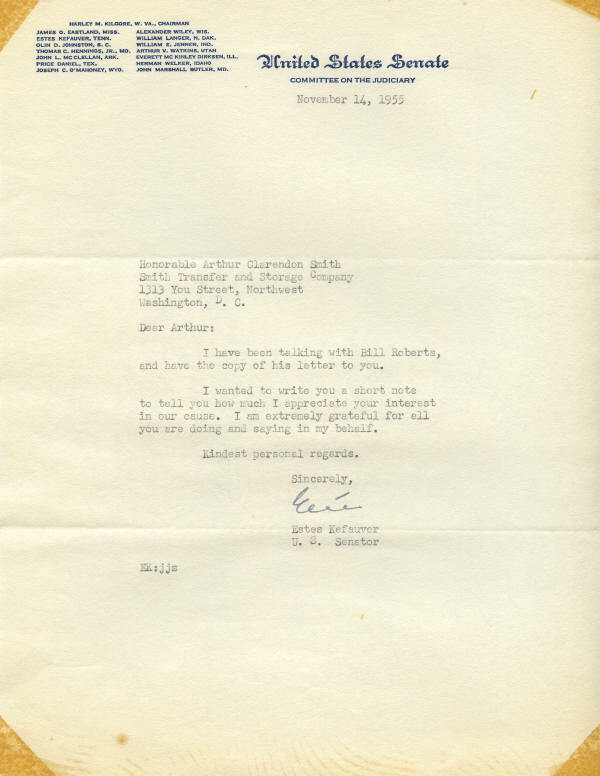 This letter follows up on another one that Kefauver wrote to Arthur Clarendon Smith, president of the Washington, D.C., Democratic Club, a week earlier in which he candidly anticipated running for the 1956 Democratic presidential nomination. He writes, in part: “I wanted to write you a short note to tell you how much I appreciate your interest in our cause. I am extremely grateful for all you are doing and saying in my behalf." Kefauver sought the Democratic presidential nomination in 1952 but lost to Adlai Stevenson, whom Harry S. Truman supported. He sought the nomination again in 1956. Once more he lost to Stevenson, but the convention chose him as the vice presidential nominee over a young Massachusetts Senator named John F. Kennedy. Stevenson and Kefauver lost the 1956 election in a landslide to incumbents Dwight D. Eisenhower and Richard M. Nixon. This letter has two normal mailing folds, neither of which affects the signature. It has cellophane tape and stains at the corners, and stains at the bottom, from prior mounting in an old photo album. It also has two small spots, well removed from the text. Overall it is in fine condition.